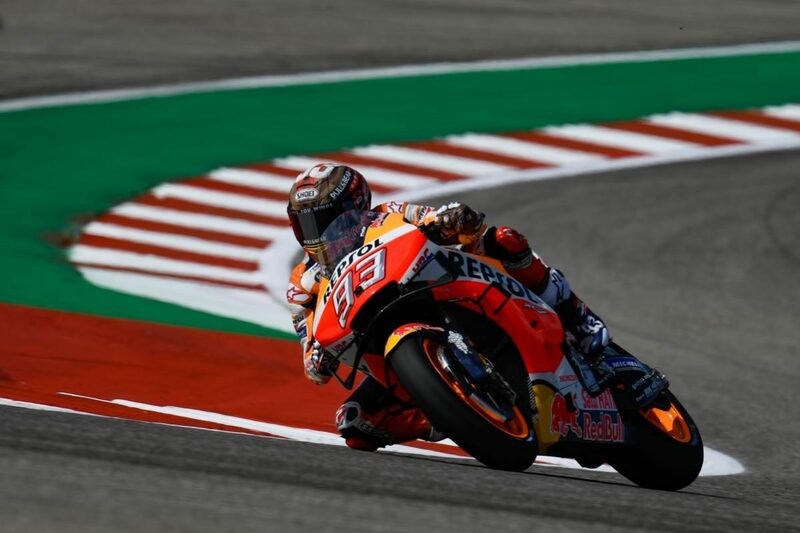 Marc Marquez has claimed a seventh straight pole at the Circuit of the Americas as Andrea Dovizioso qualified 13th for the third MotoGP race of the season. Marquez will line up alongside Valentino Rossi and Cal Crutchlow for the 20-lap race while Dovizioso was denied passage to Qualifying 2 by Mission Winnow Ducati team-mate Danilo Petrucci. On a track washed by morning storms which saw Free Practice 3 called off, Marquez took the #93 Repsol Honda to the fastest lap of the weekend, a 2:03.787s, on his first flyer in Q2. Jorge Lorenzo, who had been overtaken by Marquez on that lap, followed him for the latter half of the lap before his own factory Honda’s chain jumped as the Mallorcan exited the final corner. As he left his first RC213V leaning up against the pit wall and ran for his second machine, Rossi moved to second by the end of the first runs, from Jack Miller, Maverick Viñales, Alex Rins, and Crutchlow. Rins elevated his Suzuki Ecstar entry to third in the final minute as Rossi closed to 0.273s away from Marquez on the #46 Movistar Yamaha. Miller then knocked Rins off the front row, before he was bumped by Castrol LCR Honda’s Crutchlow before the chequered flag flew. The Australian will therefore start fourth in his Pramac Ducati GP19, next to Red Bull KTM Factory Racing’s Pol Espargaro and Movistar Yamaha’s Viñales. Row 3 is Rins, Petrucci, and rookie Fabio Quartararo (Petronas SRT Yamaha). Franco Morbidelli (Petronas SRT Yamaha) rounded out the top 10, from Lorenzo and Francesco Bagnaia, who crashed his Pramac Ducatis on each run. Dovizioso, Petrucci, and Lorenzo all went into Qualifying 1, guaranteeing that one of those factory riders would be consigned to a starting berth beyond the first four rows. The Italian on #04 waited a full four minutes to get going and did only one run, which saw him fastest until he was deposed by Lorenzo in the final minute. Petrucci was pushing late on and went 0.016s quicker while Dovizioso, who was also still searching for time, couldn’t put a whole lap together with the chequered flag out. Aleix Espargaro was the lead Gresini Aprilia in 16th. Race start is due on Monday at 0500 AEST.